Smitten. That’s what I was from the moment I saw Indiana Jones in Raiders of the Lost Ark in 1981. I mean, seriously… weren’t you? Harrison Ford and archaeology became intertwined and favorites in my world. I even applied to study archaeology at the Hebrew Universtiy in Jerusalem in 1983, which never happened, and has remained one of my life’s regrets. How else can you explain the fact that, 30 years later, I came back to Israel to became a tour guide in this land of biblical archaeology? 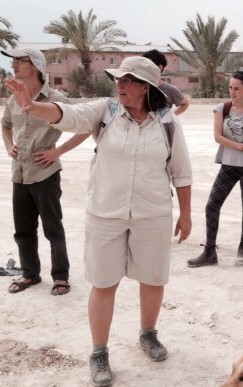 I even try to dress a little like Indy when I guide. Come to think of it, I need a better hat. This past weekend, my husband and I decided to get away and spend some quality time together. I had just finished two weeks on the road and will be taking off for another twelve days of touring this week. So where, oh where can we find a sweet place to stay? I have wanted to explore the small community of Zippori, only 10 minutes away, and asked my husband to find us a nice B&B there. Little did we know, but we were in for an Indiana Jones style adventure! I can see Zippori National Park from my house (literaly); the Crusader citadel on the hill, giving a great vantage point to whoever controled it through the ages, also giving the place its name – Zippori, from the word ‘zippor’, Hebrew for bird – a bird’s view. From the Neolithic era, to the Iron age, to the Hasmoneans who first build a Jewish town there, Zippori has been an important urban area, being the largest city, the capital of the Galilee during Roman and Byzantine times. 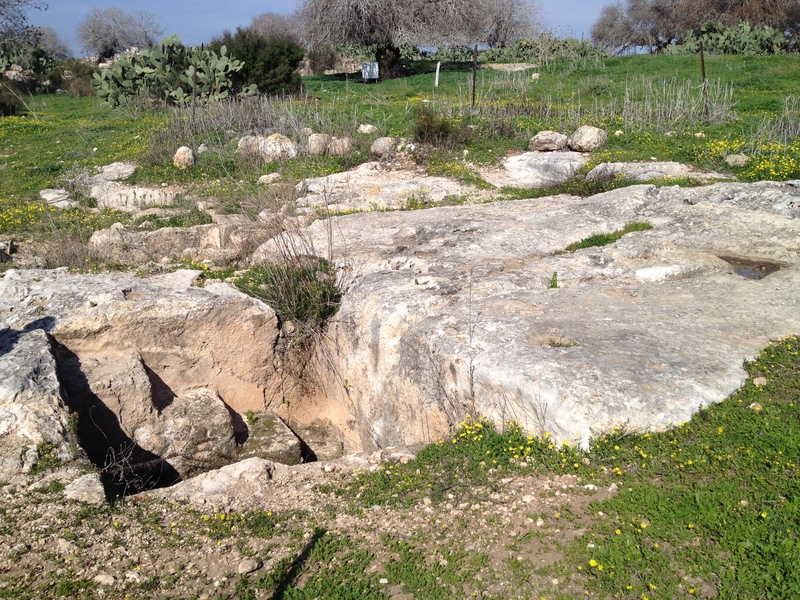 It was in Zippori that the Mishnah was compiled by Rabbi Yehuda HaNassi. Until the 7th century, it was a mixed city, inhabited by Jews, Roman pagans and Christians. Ongoing excavations started in the 1980’s have uncovered an amazing city of synagogues, churches and pagan temples, private villas, streets and public buildings, gorgeous mosaics and exquisite evidence of Zippori’s grandeur during the Roman/Byzantine/Mishanic/Talmudic times from the 1st to the 6th centuries CE. After the Crusaders fortified and rebuilt it in the 12th century, it was taken over by the Mamluks and became a small Muslim town for several hundred years. Today, next to the National Park and the excavations, lies the lovely, modern village of Zippori. Nestled away among lush greenery and rolling oak hills, it includes family homes and agricultural farms, horse stables, the Rish Lakish organic olive press, and several B&Bs. We headed to the Makom Lachlom, ‘a place to dream’, a couple of nicely furnished, quaint log cabins, equipped with luxurious jacuzzi, small kitchenette and plenty of quiet. Perfect. However, what caught my eye was what I saw when I looked out the window of our cabin. An ancient Roman pool ?!? 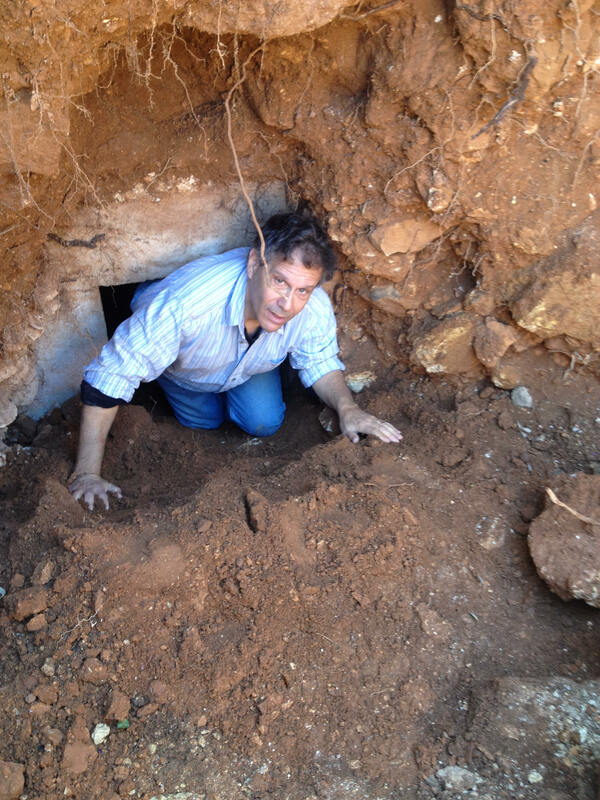 Owner Avi Hazan told the story: When he and his partner bought the land to build a small farm and a B&B, they began digging the foundations for three log cabins. 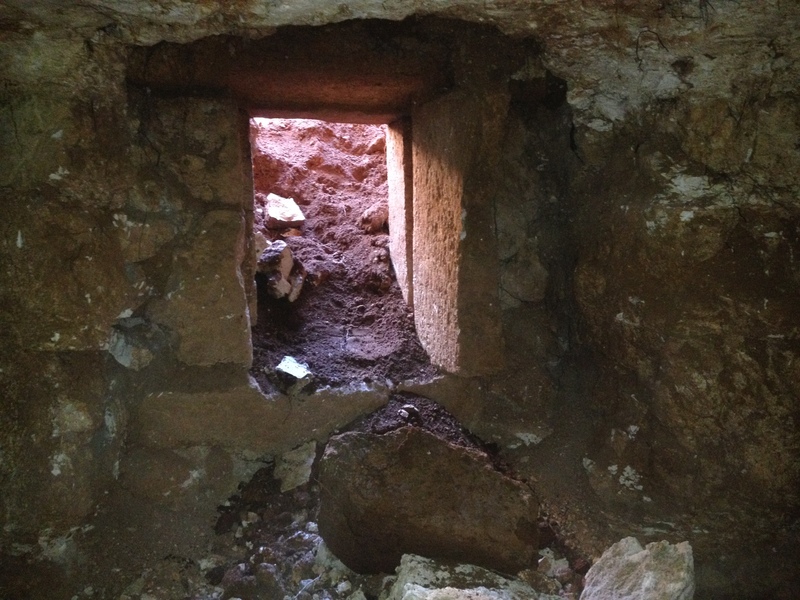 Lo and behold, they found the remains of what seemed like a Roman era pool. 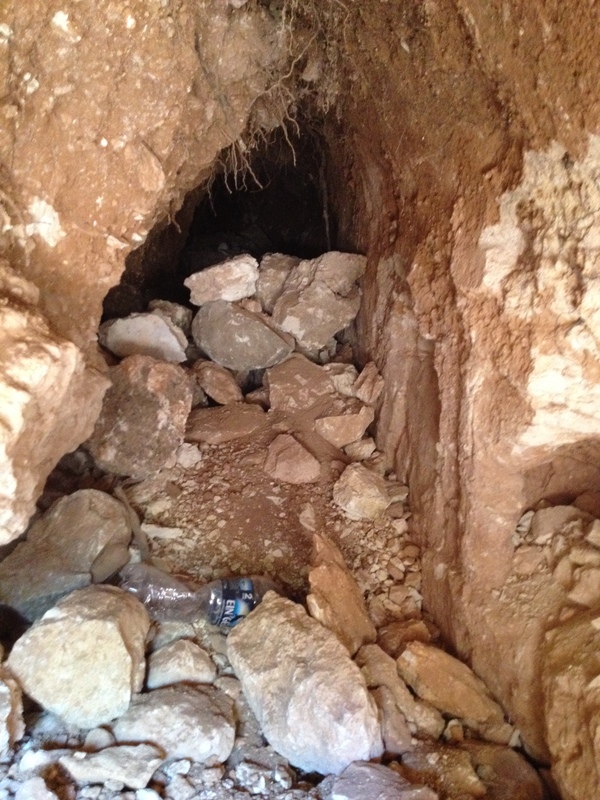 They called in the Antiquities Authority who immediately began a salvage dig, putting Avi’s plans on hold for almost a year and many tens of thousands of shekels over budget. What the Antiquities Authority found was the foundations of a large Roman bathhouse, with three pools and aquaducts leading water from one pool to another. Two of the pools were not well preserved so they were filled in and the cabins were built over them. The middle pool, however, was in good shape and was kept. 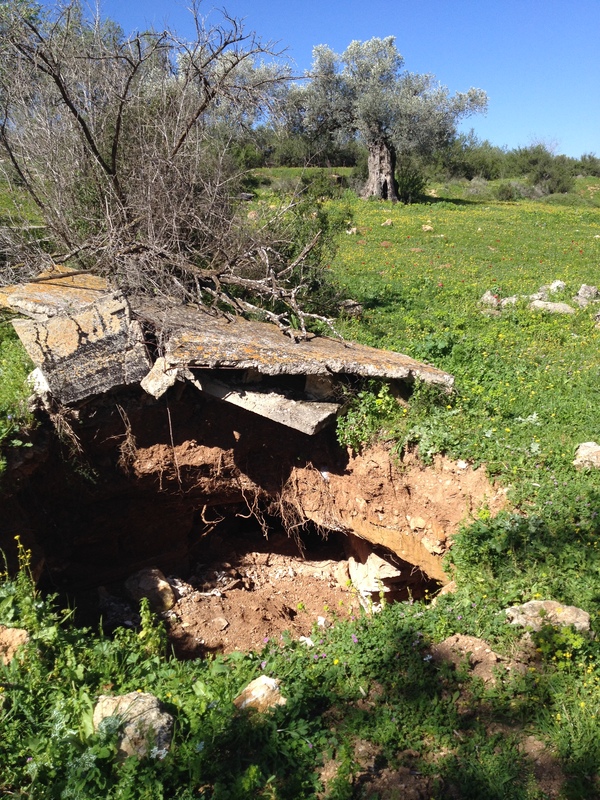 Avi told us that several families in the village had found Roman remains and even the ancient tombs of well known Jewish rabbis. ” Are there other Roman remains we can see?” I interrupted. “Where? Can we see the now?” I was getting more excited by the second. 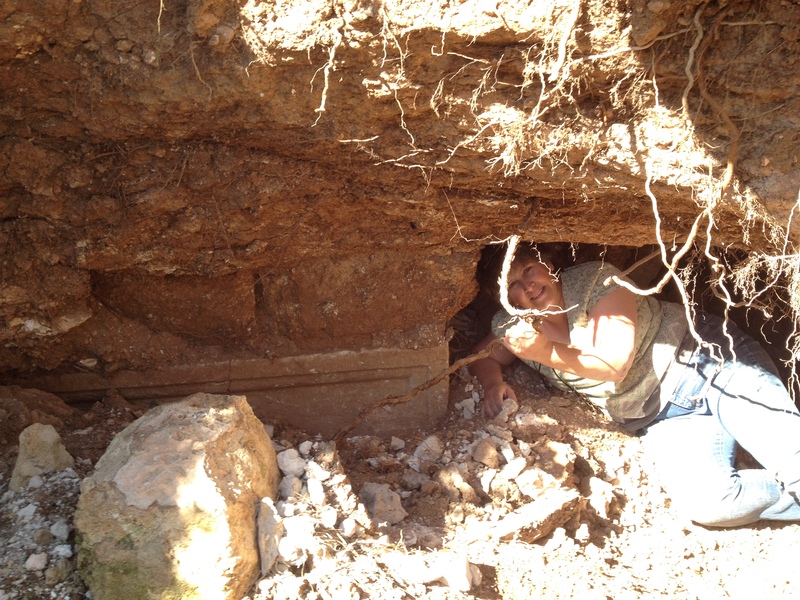 Avi explained that a while back, some antiquities robbers had dug a large hole in the ground and found some Roman sarcophagi before they were driven off by the police. The archaeologists don’t have the budget to propely excavate, so the site remains untouched. 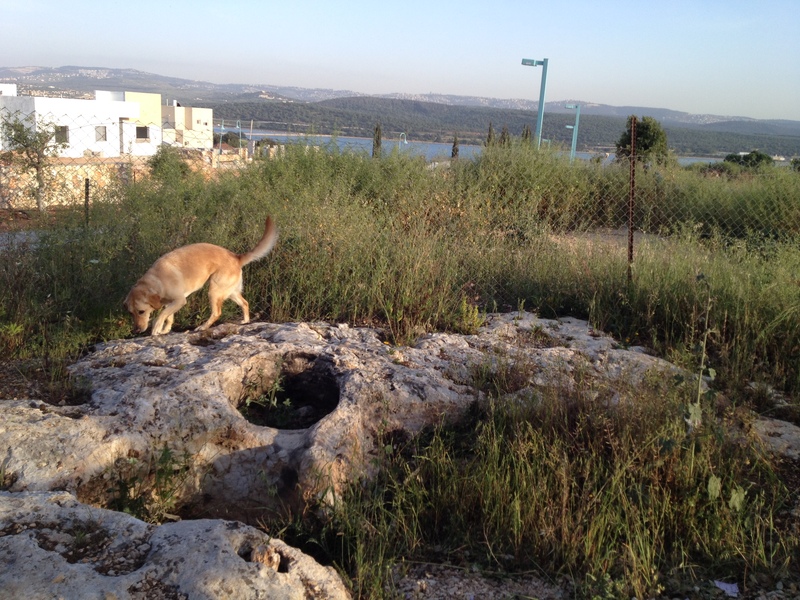 Avi keeps an eye out for robbers and notifies the Antiquities Authority if he notices anything suspicious. Yitzhak and I were off like a flash. And we found it! 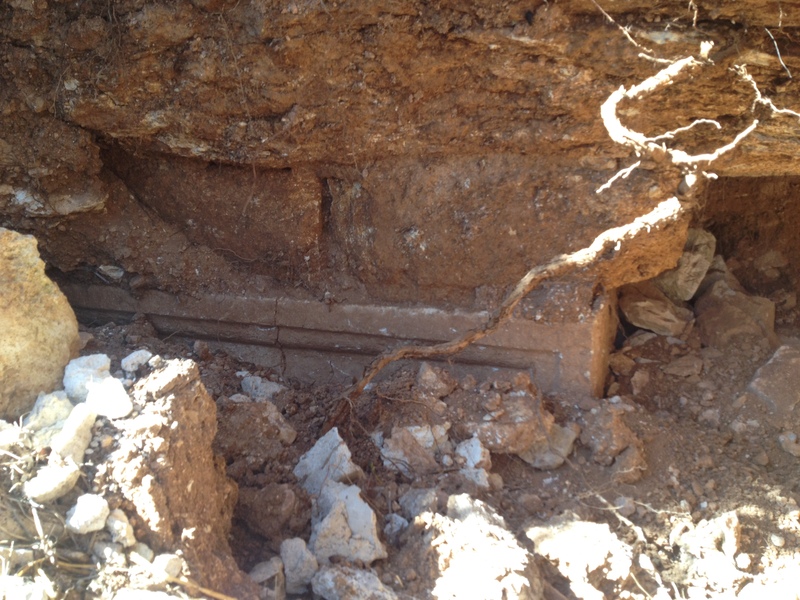 The first thing we noticed were two sarcophagi half buried in the dirt. A sarcophagus (from the Greek for ‘flesh eater’) is the common name for an ancient Egyptian, Greek or Roman coffin). Yikes! I was so excited, my ‘Indiana Jones’ instinct took over and I immediately jumped in. With both feet. Yitzhak followed. We found an small opening on the side and crawled in. 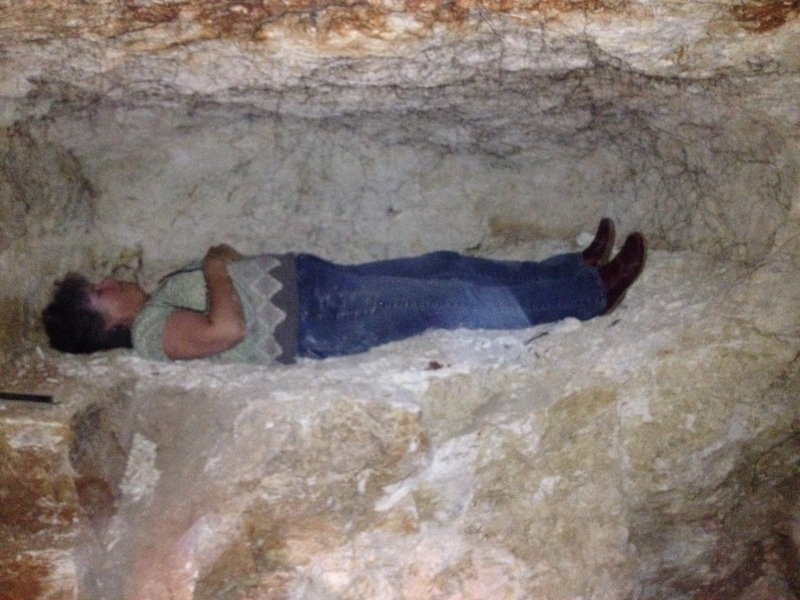 It was a family burial cave, with niches for laying the bodies of the dead. About a year later, when the flesh had rotted, families collected the bones and placed them in ossuaries, bone boxes, that were usually kept in the home. This form of burial for wealthier familes was very common in the 1st – 6th centuries CE. The limestone hill we climbed must be dotted with many of these burial caves. 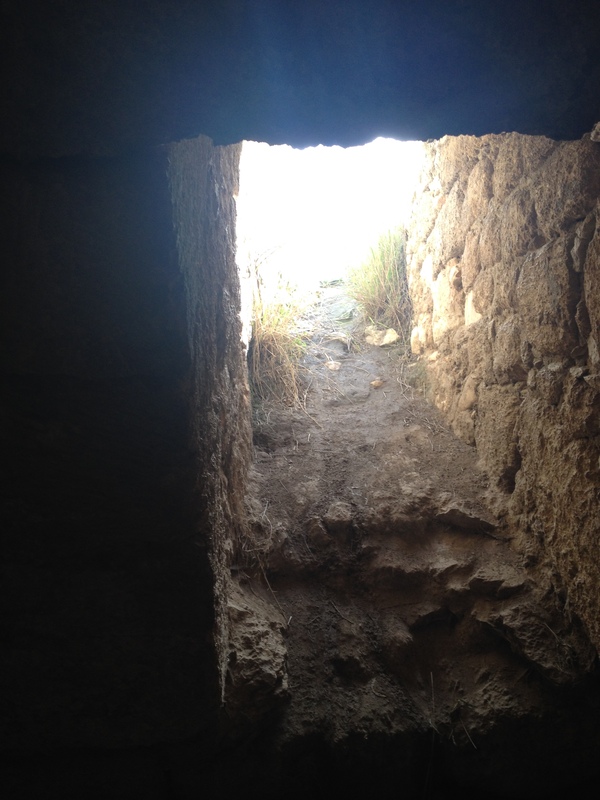 That was logical because we were across the small valley from ancient Zippori and these could very well be Jewish family burial caves, excavated as tradition dictated, outside the city walls. We explored some more, got dirty and LOVED IT! 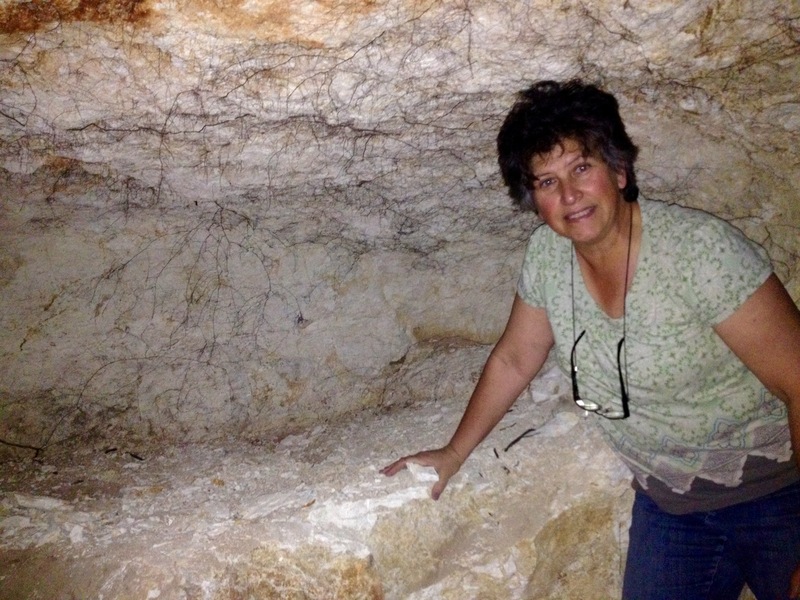 We crawled in an unexcavated burial cave from Roman times, touched sarcophagi that were still buried in the dirt… real Indiana Jones moment. As were climbed out, our attention turned to some collapsed concrete buildings that were around us. There were six or seven of them, one sitting right on top of the hole we had just climbed out of. Yitzhak and I tried to figure out what they were. 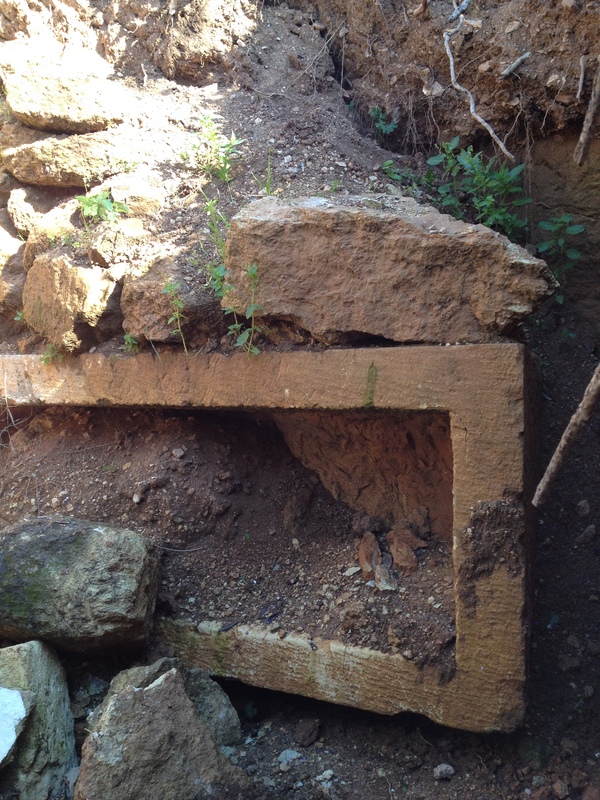 Concrete doesn’t fit ancient times, so it must have been from the 20th century. Then, we both knew. 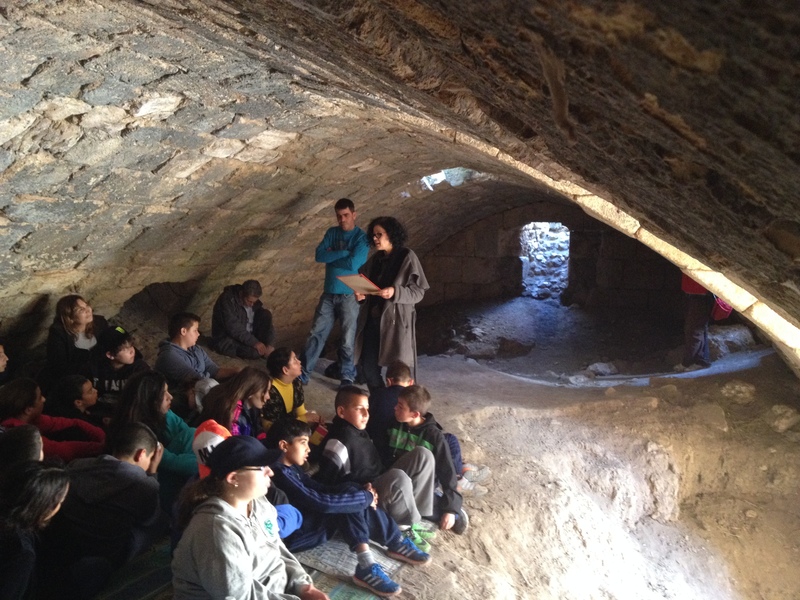 The Arab village of Saffuriyeh was originally built by the Mamluks in the 14th century on the ruins of the Crusader town, on the ruins of the Byzantine, on the Roman/Jewish ruins. It maintained remnants of its original Jewish name Zippori, via the Greek name Sepphoris. It stood here for several hundred years, through the War of 1948-49. After six months of civil war, the British Army left Palestine on May 15, 1948, and then several Arab armies attacked Israel on all fronts. The Arab Liberation Army (ALA), headed by its Iraqi leader Fawzi al Qawuqji, was headquartered only 5 kms away from Saffuriyeh, in Nazareth. In early July, the newly formed Israeli Defense Forces (IDF) started its main offensive in the Galilee, named Operation Dekel, and designed to push the ALA back. The village was known to harbor ALA fighters, so as the soldiers approached, the village was attacked with mortarshell fire, causing villagers to flee their homes in panic. 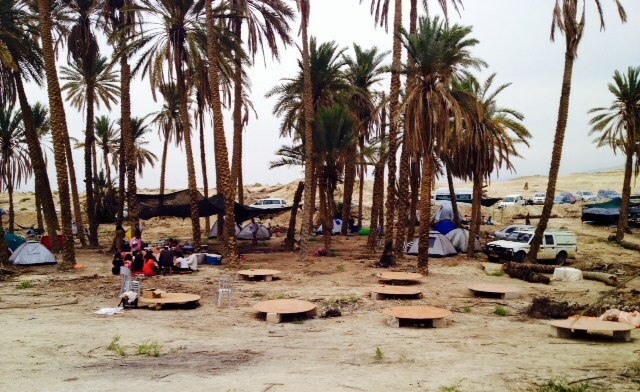 Many villagers from Saffurieyh ended up in refugee camps in Southern Lebanon. 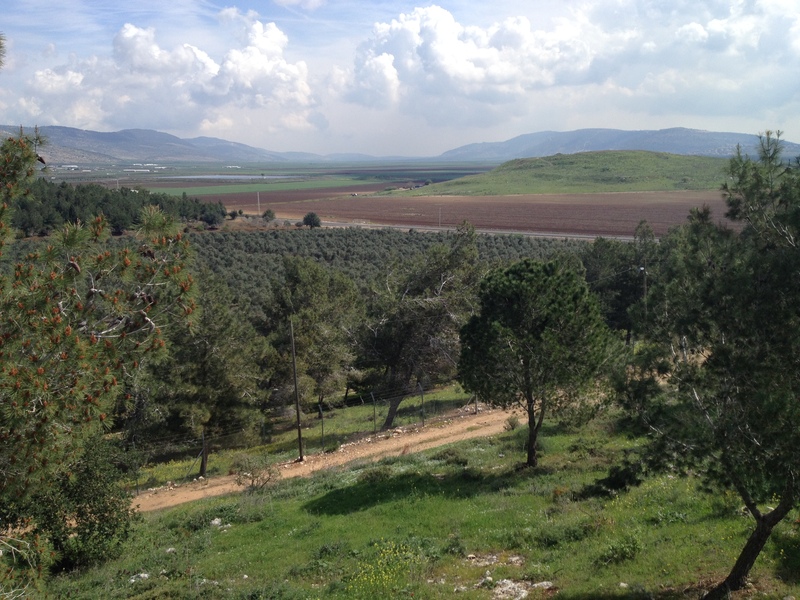 Others settled in several of the villages closer to Nazareth, such as Ilut and Raame. Four hundred villagers remained in their homes in Saffuriye and eventually received Israeli ID cards, although they were all removed from the village and made to re-settle elsewhere in the early 1950’s. Click here to read the story of one such family, the al-Alzharis. 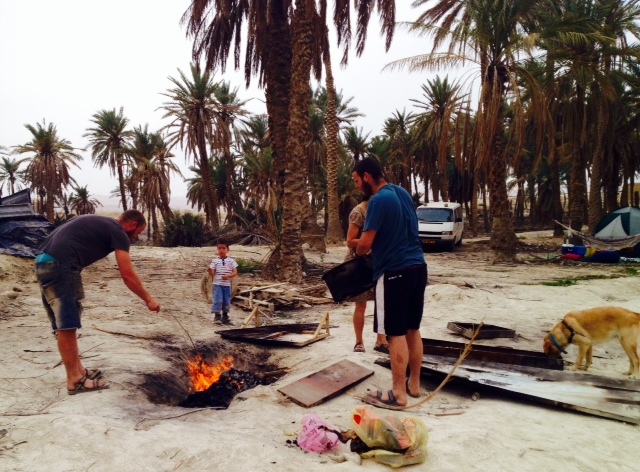 After the war, however, the Arab population that had fled the fighting had begun returning to their villages. This presented a serious problem for the newly created State of Israel. The authorities worried about a fifth-column growing among the Arab villages and didn’t want to have to ‘capture the land all over again’. Over a million Jews streamed into the newly founded State of Israel within its first 5 years, tripling its Jewish population. Finding them places to live became a high priority, and several new immigrant families founded a new Jewish village by the name of Zippori, on the lands of the Arab village of Saffuriyeh. This beautiful land, with its layers of history and archaeology is a complex place, ripped apart by war and strife, conquests and conflict. Living among these stories, within sight of archaeological marvels like Zippori, and walking the land like Indiana Jones, knowing that somewhere beneath my feet are buried the remnants of some ancient civilization… is mind boggling. And so cool! P.S. I send Harrison Ford my most sincere wishes for a Refuah Shlemah, ‘speedy recovery‘ after his flight mishap. Please take care of yourself. 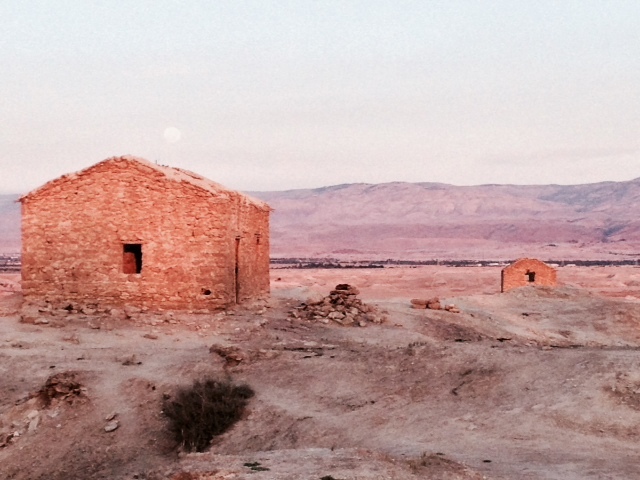 Where in the world can you do what my family and I did for Passover? Nowhere else but here. But first, let’s recap one of the greatest stories ever told. 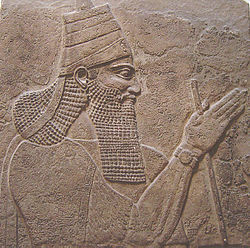 Around 3,500 years ago, the Israelites escape from slavery in Egypt. After wandering in the desert for forty years, their leader Moses dies without ever setting foot in the Land of Israel. God chooses Joshua to guide the people and orders him to lead the Israelites across the Jordan River into the Promised Land. The crossing begins as the priests walk ahead carrying the Ark of the Covenant on their shoulders. They step into the rapidly flowing Jordan River, trusting that God will protect them as they cross. The Bible states that God performed a miracle and the waters of the mighty Jordan stopped flowing and allowed all the Children of Israel to cross safely to the other side. Joshua 4:9 And the LORD said to Joshua: ‘Today I have rolled away from you the disgrace of Egypt.’ So that place was called Gilgal, as it still is. 10 Encamped in Gilgal, in the steppes of Jericho, the Israelites offered the passover sacrifice on the fourteenth day of the month, toward evening. 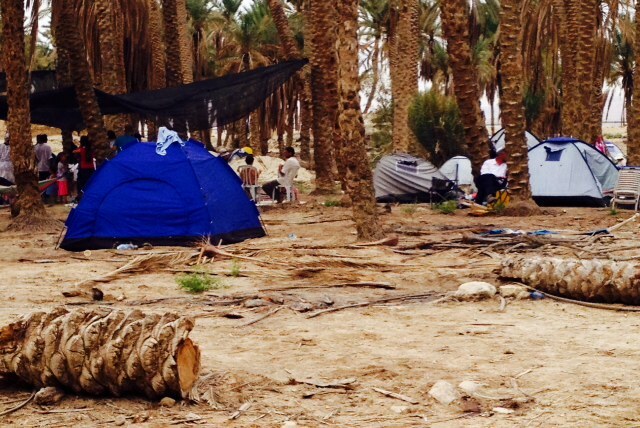 So seeking adventure, camping, meaning and spirituality, my family and I joined a group of about 120 Israelis and celebrated the first day of Passover in the wilderness. 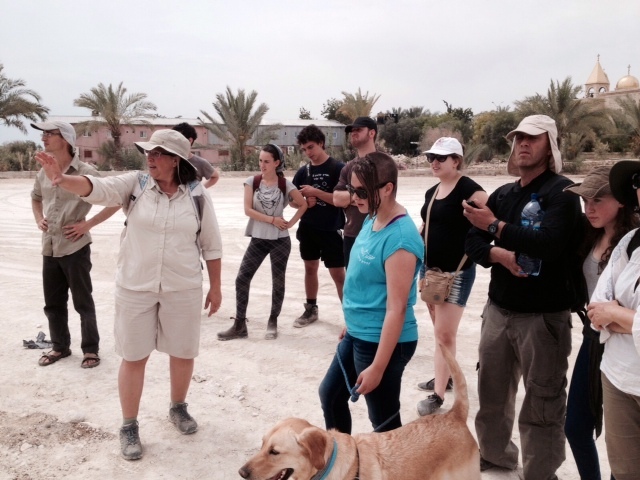 This group, organized by the remarkable Dvir Raviv, a student of archaeology and Jewish history, started this tradition five years ago. 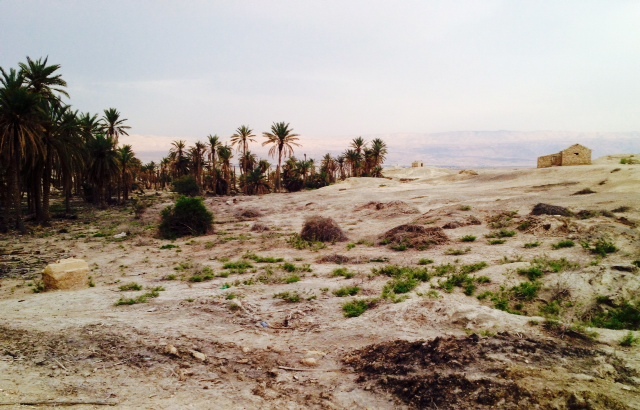 We camped in Gilgal,on the steppes of Jericho, where tradition states the ancient Israelites stayed upon crossing the Jordan River. 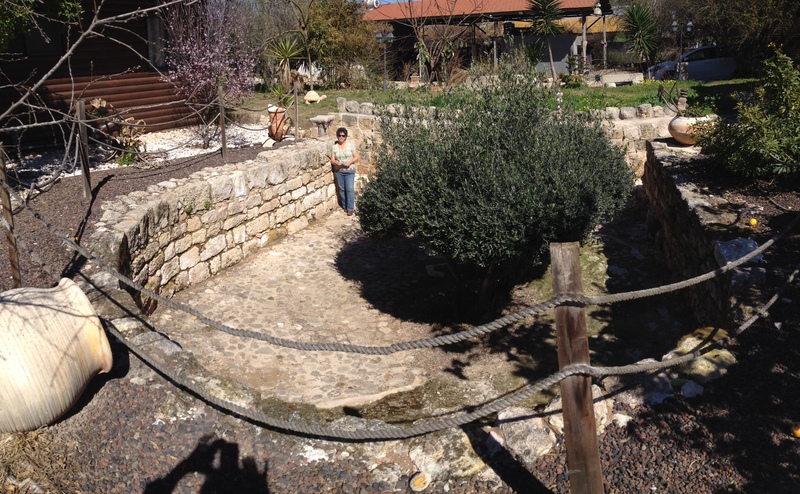 We ate the Passover meal, the Seder, where the Israelites held their first Passover meal in the Promised Land. And we did this on the fourteenth day of the month of Nissan, the first day of the festival of Passover. Talk about meaning! It was mind-blowing. The ancient (and modern) city of Jericho lay two kilometers to our west; the ancient city of Adam, where the waters of the river were miraculously held still, was a little distance to the north; the Jordan River and the place of the crossing was a mere kilometer to our east; the Dead Sea, a short ten minute drive south. 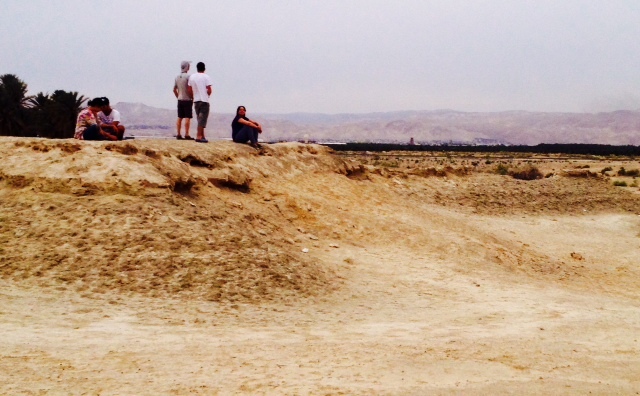 The site of the Israelite crossing of the River Jordan was a revered place for generations. In the 4th century c.e, it became a Christian pilgrimage site as the traditional site where John the Baptist baptized Jesus. Today it’s called Qasr el Yahud, (Arabic for ‘the crossing of the Jews’), and the countries of Israel and Jordan offer baptismal facilities on both banks of the river. 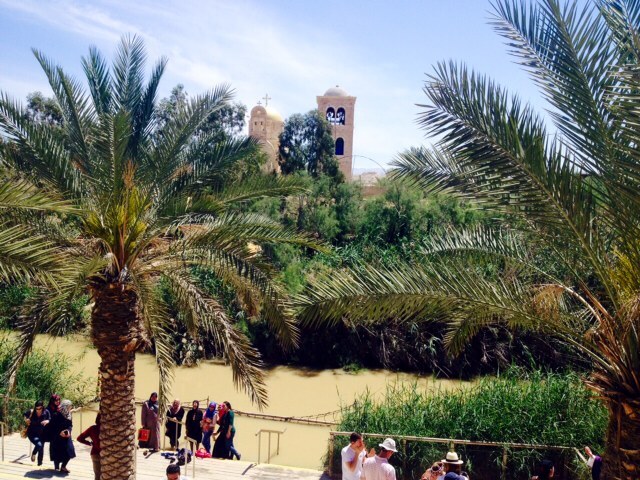 Muslim visitors approach the waters of the Jordan River at Qasr el Yahud, the Baptismal site. 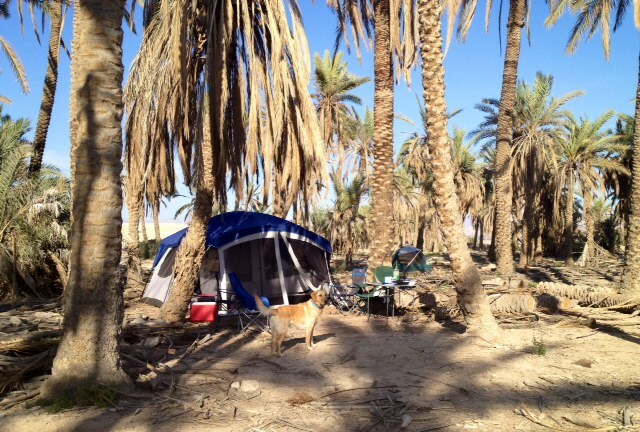 We camped in a deserted date-palm tree grove amidst the gorgeous beauty of the Jordan Valley. The food was pre-cooked and delivered by caterers a few hours before the feast. Some of us were in charge of digging a fire-pit and warming up the food, while others set tables and prepared the kitchen area. As Jewish tradition mandates, all 120 of us began reading the Haggadah together, recalling the story of the Exodus, how God led our people from slavery to freedom, from Egypt to the Land of Israel. 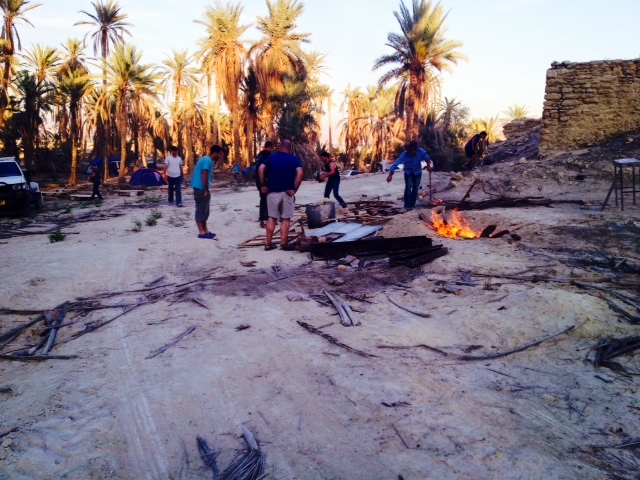 Pretty soon each table went off at their own pace, reading and laughing, singing and bellowing into the desert night. It was quite a wonderful cacophony! 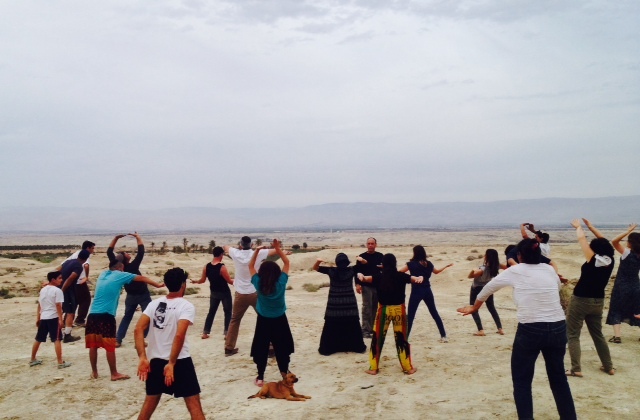 The next day, first day of the festival of Passover, included many activities to choose from: resting, praying, hiking, roasting the Pascal Lamb for lunch, sleeping, tai-chi or study lessons from our sacred texts. A walking tour to the nearby monastery of St. Gerasimus, led by yours truly. Most of the group packed up and left after dark but some friends and us stayed on for another night . 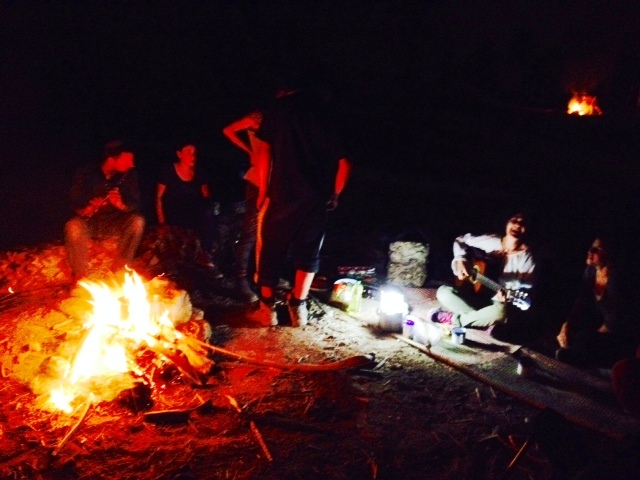 We lit a bonfire, cooked some potatoes and onions in the flames, pulled out a guitar and had a great time. Following in the footsteps of your biblical characters of choice — Joshua and the Israelites, Jesus, King David, Jezebel or Samson… it can only be done here, in Israel. 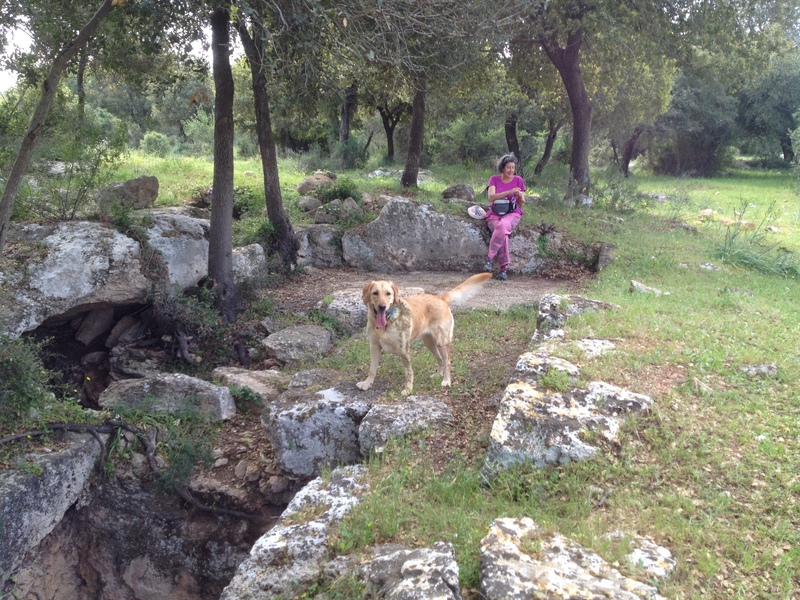 My friend Linda and I were hiking along the trail by the nearby village of Solelim, chatting and trying to keep my labrador, Na’ala, out of trouble (she rolls in every cow poop and splashes in every stream). We took in the gorgeous natural beauty around us; a gnarly oak forest, colorful spring flowers, lizards, butterflies and birds galore, and the occasional dugout cave in the limestone. “Really?” she answered, “I didn’t know that”. Now, I don’t know if she does this on purpose, but being the good friend she is, Linda always sets me up to tell the history of this hill or that ancient site. And she listens patiently. That’s what friends are for. So I started telling her about the ancient wine production that flourished in the Lower Galilee during the Roman and Byzantine times. When the Romans expelled the Jews from Judea and Jerusalem in the 1st and 2nd centuries and forbade their return, many of the Jewish people migrated north and settled in the Galilee. They eventually lived side by side with the Roman soldiers, developing friendships and business relationships in many small villages and larger mixed towns. When the Byzantine Empire took control of the land in the 4th century, the Jews continued living among the growing Christian population until the conquest of the Muslim empire in 640 c.e. The Jews have always used wine as part of their religious rituals. Vineyards are ubiquitous in the Bible; Noah planted the first vineyard, Micah’s vision of peace was when one sat under his vine and fig tree, grapes are one of the seven special agricultural species of the Land of Israel, and don’t forget Moses’ spies returning from scouting the Promised Land with a huge cluster of grapes. The Hebrew word for wine, ya’een, is mentioned 141 times in the Bible! Moreover, wine was widely consumed by all ancient Mediterranean and Fertile Crescent peoples; Egyptians, Mesopotamians, Greeks and Romans alike. The alcohol in the wine killed the bacteria in the otherwise fetid water they drank. The wine was diluted with water and due to its short production time, contained only around 4% alcohol. Romans believed wine to be an essential daily necessity and made it available for everyone: slaves, peasants, legionnaires, women and aristocracy. In fact, Roman citizens (and Jews) consumed a liter of wine per day! Therefore, as the Jewish and Roman population of the Galilee grew, so did their need for wine. Lots of it! Wine production was a major local industry and was exported to the rest of the Roman Empire, providing jobs, giving growers and merchants needed business and trade opportunities. Hundreds of vineyards were cultivated in the hills of the Galilee, and each vintner needed a place to crush the grapes and ferment the juice. Theses wine presses, some small enough for one vineyard, others large shared by several vineyards, were carved into the limestone bedrock. As I was jabbering away to Linda about Galilean ancient wine making, we came upon a couple walking towards us on the trail. “Are you coming from the ancient wine press?” they asked. 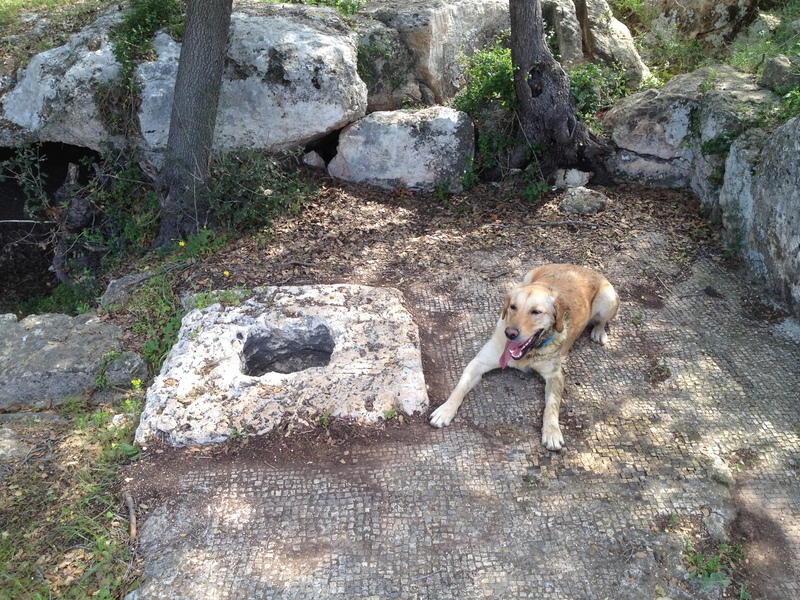 And lo and behold, they led us a few paces off the trail to a most magnificent Roman-Byzantine era wine press at the top of the hill, complete with two liquid gathering vats, and a beautiful mosaic covered grape crushing floor. We find hundreds of ancient wine presses in Israel today, from the Negev desert in the south to the Golan Heights in the north. 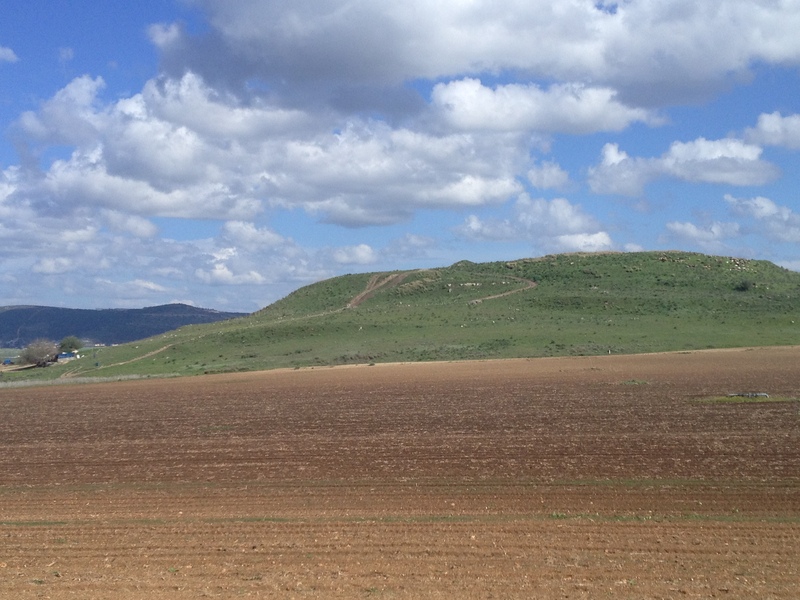 Many of these are located close to my home in the Galilee. 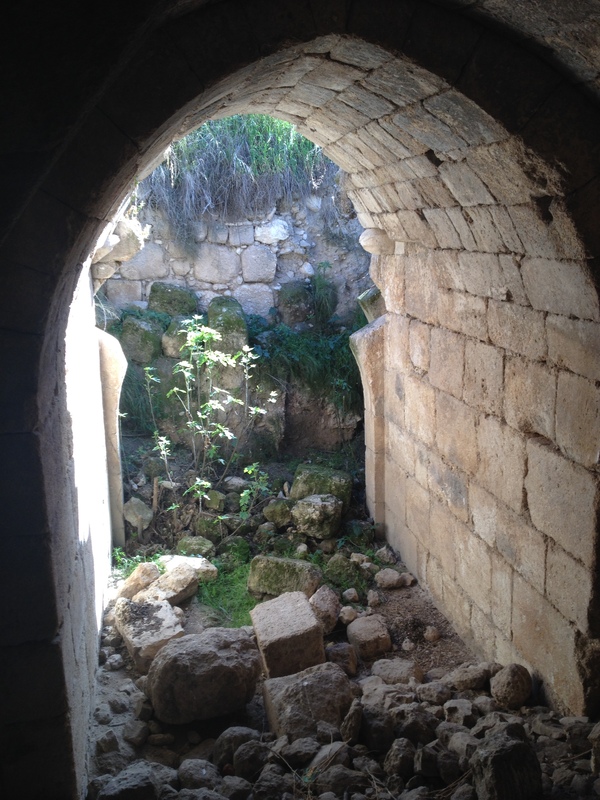 For example, there is one among the ruins of Usha, a village that served as the first Galilean stop for the Sanhedrin in the 1st and 2nd centuries. 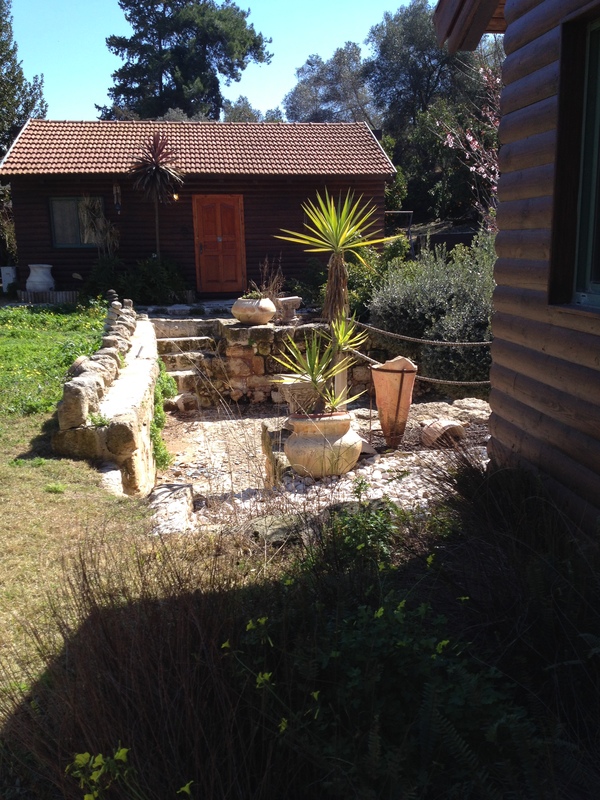 And there is also one located just a few steps from my home, on the Kibbutz Hannaton hill! What is even more exciting is that not only does Kibbutz Hannaton have its own ancient Roman-Byzantine wine press, but it is also the home of Jezreel Valley Winery. My friends Jacob Ner-David and Yehuda Nahar followed their dream of reconnecting with the land and renewing the ancient Jewish tradition of wine making by founding a new “start-up” boutique winery that is already winning prizes. I love the fact that Jacob and Yehuda purposefully chose to use grapes with a unique Israeli story for their flagship wine, the RedBlend. The Argaman variety was developed in the Weizmann Institute in Israel in the 1990’s, making it a ‘sabra’ (Israeli born) grape. 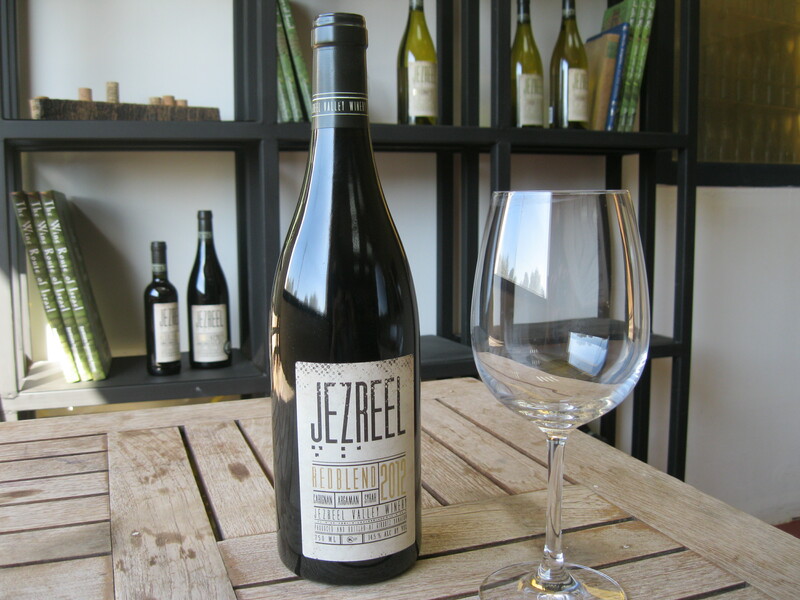 Jezreel Valley Winery is the only Israeli boutique winery that chose the Argaman as its main varietal. The Syrah originates from southern France and is perfectly suited for Israel’s Mediterranean climate. And the Carignan? This Mediterranean variety was introduced to the Land of Israel at the end of the 19th century, just as the modern Israeli wine industry was in its infancy. It gave high yields cheaply and became the backbone varietal used to make the thick, sweet, sacramental wines produced for so many years by Israel’s major winery, Carmel Mizrahi. As the Israeli wine industry underwent a quality revolution in the 1970’s and 1980’s, the Carignan vineyards were slowly neglected, many of them uprooted and replanted with more sophisticated varietals such as Cabernet Sauvignon. However, about twenty years ago, vintners noticed that the abandoned Carignan vineyards were yielding less clusters but the quality of the grape had greatly improved. Once abandoned and left to die, the Carignan grapes made an amazing comeback! The Carignan varietal once used solely for sacramental wines in Israel is now being used to create prize winning, world quality wines. Wow! Jacob and Yehuda have built Israel’s first successful ‘start-up’ winery, now offering all of us wine and Israel aficionados an opportunity to partner with them in this venture. The story of wine making in Israel today is a continuation of an ancient tradition, renewing the old, returning to the roots, reconnecting with the land. One of the reasons I moved to the Galilee a little over three years ago was because of the diversity and daily multicultural encounters we experience here. Jews, Bedouins, Arab Muslims, Arab Christians, Circassians, Druze… we all live side by side in a fragile co-existence that defies the odds. Our small community of Hannaton is bordered by the Bedouin village of Bir el Maksur less than a kilometer to the west, the Arab Muslim town of Kafar Manda only 3 kilometers to the north, and a few more Bedouin and Jewish villages to the east and south. A hodgepodge of people and cultures, faiths and customs, languages and traditions. Does it work? Actually, yes it does! 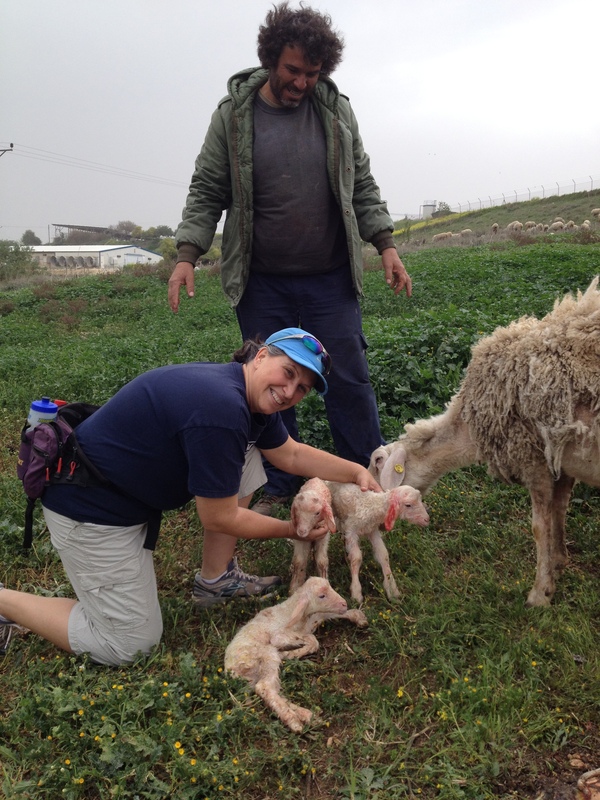 Allow me to share an amazing event my husband and I witnessed last week on our usual Shabbat (Sabbath) hike in the fields around Hannaton. 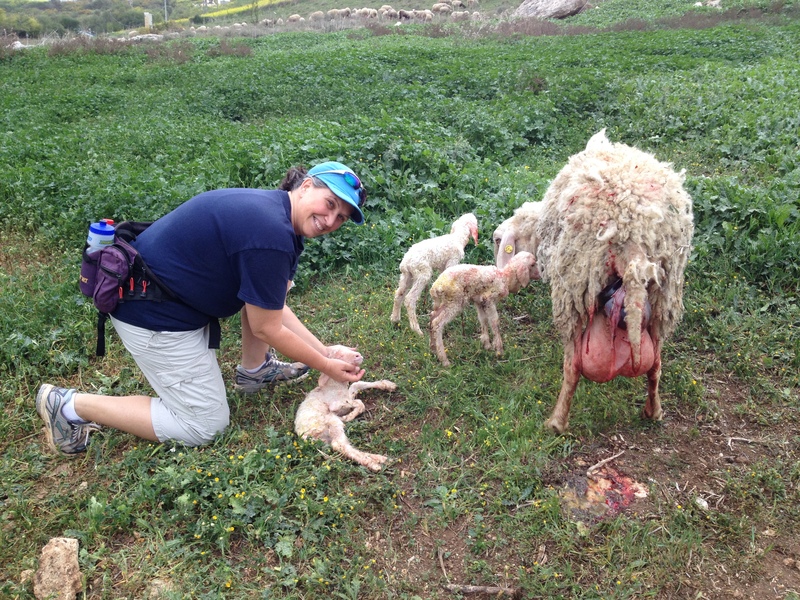 However, instead of telling us to stay away, the shepherd called and invited us (dog and all) to come closer and see something… and so began a new friendship, an amazing hour together as we shared in the miracle of life.